Is there anything better than waking up on a weekend morning, knowing there's a farmers' market to attend? Ok, maybe waking up to a basket of cash (or kittens) would be better, but farmers' markets are definitely something we look forward to. Alberta is chock full of wonderful indoor and outdoor markets - some seasonal and others year-round. They're a great place to go when you're looking for the freshest produce, a funky piece of art, a unique gift or want to skip the traditional weekend brunch and try a new dining experience. Alberta Agriculture and Development recently released a map of Alberta's 130 farmers' markets. 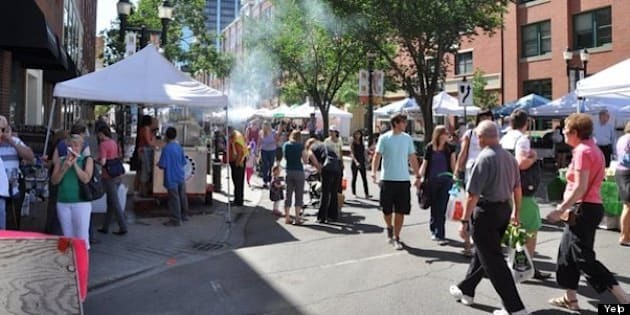 Almost 75 per cent of Albertans visited a farmers' market within the past year and spent an average of $55 per visit. On average, Alberta households spent $671 at farmers' markets in 2012. Alberta Agriculture does their best to ensure an authentic experience for both vendors and customers. Alberta markets are required to be run by a non-profit group and 80 per cent of vendors mush meet the "make it, bake it, grow it" criteria. Approved markets must also operate for at least 10 days per year and for at least two hours on market day. Take a look at some of Alberta's most popular markets.